The idea of bringing your clubs with you on vacation or a golf trip can be quite overwhelming. Especially as most golfers put a substantial investment into their equipment. However, you can have the peace of mind you need while traveling once you have the right travel bag. The Sun Mountain ClubGlider Meridian. Similar to other travel bags on the market. This unit has an array of unique features that you’re sure to appreciate and use to your advantage for short and long trips alike. Once you have the opportunity to purchase a travel golf bag. You'll finally realize just how easy it is to bring your equipment with you on every trip. No matter if you're attending a destination wedding or if you're going on vacation with your family. There's nothing better than being able to protect your golf clubs and related accessories while flying. What are other golfers saying about the Sun Mountain Golf Travel Bag? The Sun Mountain ClubGlider Meridian was released in 2018. You can guarantee that it’s equipped with the high-end features that you would expect to see in a modern golf bag. After your first use, you’ll immediately realize that during manufacturing, the customer was put first. This is an incredibly user-friendly travel bag. What makes the Sun Mountain ClubGlider Meridian different from other travel bags? It doesn’t compromise durability for features or vice versa. You’ll be able to reap the benefits of both high-quality construction and useful components. The full package is easily accessible and well worth the money. When other golfers see you in the airport with this bag the will be envious for sure. You can push this thing around with one finger according to one happy customer. This thing is so well designed to be easy to move around. In comparison to other travel golf bags on the market. Some are specifically designed for either men’s or women’s clubs. The Sun Mountain ClubGlider Meridian is designed to be large enough so that it can accommodate both. It’s important to know though that it’s too large to fit children’s clubs comfortably. Small sets won’t be able to be secured inside of the bag. If you’re the type of person that enjoys traveling far distances for a game of golf with friends or family. You should also be considering the Sun Mountain ClubGlider Meridian. Its entire design is centered around protecting your clubs and other golfing accessories. It’s also the perfect partner for trains, boats and even in the back of your personal vehicle. Essentially anyone who is interested in keeping their golf clubs safe and secure when being transported. Trips from one place to another will benefit from using the Sun Mountain ClubGlider Meridian. It can also be a great tool to have when storing your clubs in your garage for an extra ounce of protection against weather and fall damage. "I'm 66 year old female and had zero difficulty with this bag"
"this bag was e-a-s-y to travel with and maneuver"
"A bit expensive, but the design makes it easy to pack and travel with. " "I easily fit clubs, modern bag, shoes, rain gear, box of balls and various other items in mine easily." "With stand activated, it's like a spinner bag; extremely easy to maneuver around the airport, hotel, etc." ​"This golf travel bag lives up to Sun Mountain's reputation." You’re very unlikely to receive any additional components with a travel golf bag. The Sun Mountain ClubGlider Meridian is no different. You’ll receive a user manual and the bag itself with your order. You’re not going to need any additional components as everything is pre-installed on the bag prior to being shipped. Retractable legs: The legs that are included in the frame of this travel bag. Easily extended and retracted with a single motion. You won’t have to bend down in order to store and secure the legs in the bottom of your golf bag. Two-way zippers: Easily accessible zippers are exactly what you need on a travel bag. The two-way zippers integrated into the product to make it even easier to access everything that you have stored. You can also lock most of them with TSA-approved locks to protect your belongings from theft. Pivoting wheels: Each of the wheels on the Sun Mountain ClubGlider Meridian is constructed out of caster, which gives them superior durability. They also pivot, giving you more maneuverability than when you use traditional travel golf bags. Easily foldable: When the Sun Mountain ClubGlider Meridian isn’t in use. It can easily be folded so that it can be stored in hard-to-reach areas until golf season approaches. Variety of Colors: It comes in many different colors so it stands out from the rest of the black golf travel bags. As an alternative to the Sun Mountain ClubGlider Meridian Golf Travel Bag. You’ll want to take a look at the Bag Boy T-700. Especially if you are tight on budget. It not only has a couple of extra features but it’s also available for half of the price of the Sun Mountain bag. The Bag Boy T-700 appears to have more padding along the middle of the travel bag than the Sun Mountain ClubGlider Meridian. All the zippers on the Bag Boy T-700 are fully lockable. You can have peace of mind when you travel with your golf clubs. 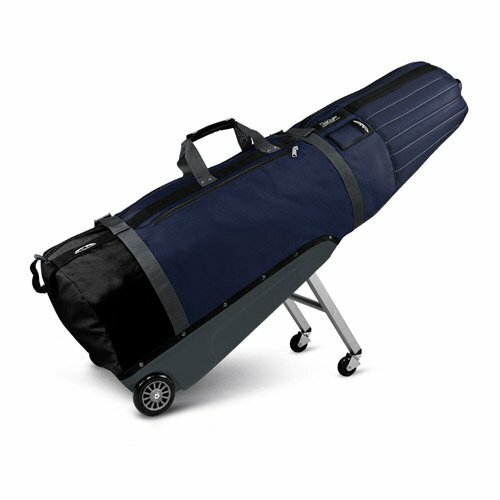 However, this has a slim design and can only accommodate a number of golf accessories and may require more effort when moving it around. If you’re searching for a travel golf bag that is going to keep all your most important pieces of equipment safe. Ranging from your golf balls to your clubs, the Sun Mountain ClubGlider Meridian Golf Travel Bag is a sound investment. Not only will it work to protect your gear. The bag is highly maneuverable that even elderly golfers won’t have to put any effort into bringing their gear on long distance trips. With the help of user-friendly components such as two-way zippers. Easily retractable and extendable legs and easily accessible pockets. There are plenty of benefits that you’ll appreciate when you start using the Sun Mountain ClubGlider Meridian Golf Travel Bag. Above all else. You'll be able to sit back, relax and enjoy your vacation. Not to worry about any signs of damage or breakage when you arrive at your final destination. There surely is a reason as to why travel golf bags such as the Sun Mountain ClubGlider Meridian Golf Travel Bag. They provide protection and peace of mind for your valuable investment.